When in Venice, there are certain things that need to be on the very top of your to do list. 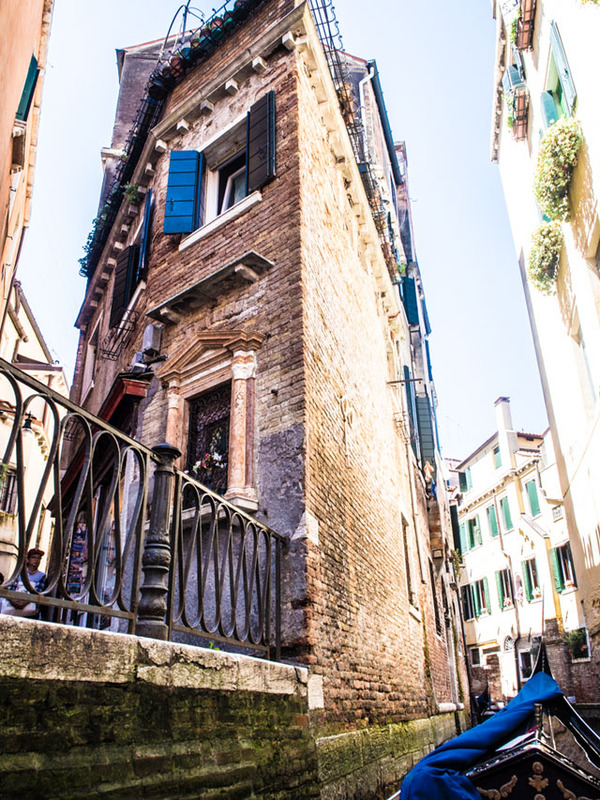 Sure, there are the staples like getting lost in the back streets as you explore, being serenaded in the process and enjoying that first bite of a beautiful gelato on a hot and sticky day in the city. Then you have the museums, the architecture, the people and the incredible waterways that are home to everything from speedboats to mega yachts (where they can fit). 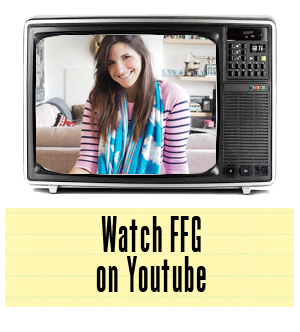 For me, there's just one thing that needs to be at the very top of your list. I mean this has to be the one thing you do no matter what. Take a gondola ride. No joke - a gondola ride is my number one suggestion for things to do while visiting this romantic city on water. Gondola rides in Venice can be a bit intimidating. It's not crystal clear how you jump on. You can wait in line at tourist desks and have someone officially organize one, if that's your style. Or you can just go straight up to a gondola dock (most are right off of the main square) and organize your ride with the gent offering his services. I swear they make it all look way more complicated than it is. Don't be intimidated. Take charge as a tourist on a mission. Now here's all you need to know about the gondola ride in Venice, including the rather important bit about payment. First of all, for those of you that have ever visited Venice during peak tourist season, you'll know that walking around the city can feel trying at times. Narrow alleyways aren't the most inviting when you're sharing the moment with thousands of people hoping to have the same historic experience. However, from a Venetian gondola, your biggest worry is oncoming speedboat traffic (ok, yes that is sometimes slightly worrying). Seriously though, you can hire the gondola on your own or with a party of five others. Whichever way you choose to go, the view is much more pleasant and quite a bit less crowded. Plus, you're seeing Venice by boat, in a relaxing lounge-like position. Now here's one thing to mention - all gondolas ride asymmetrically. I got in and the boat was definitely tipping in my direction. Naturally, as a woman, I took this as the boat registering like a scale. I as the heavier one! Damn it. No. This is not the case. •wipes sweat from brow• All gondolas actually ride with a tilt. So don't worry, it's completely natural. There is no doubt about this - the best view of Venice is from the seat in your gondola. You sit back, lounge in fact, as your driver gently paddles you through a city that is so magical it seems as if Walt Disney himself conjured it up on demand. While you get the highlights of the city pointed out to you by your driver, you also get to see beautiful and unexpected gems that need no explanation. These moments are simply priceless. You discover life happening around you. From women hanging their laundry to men playing "La Vie en Rose" on the side streets for tourists, your view will be so overflowing with activity that you may experience a slight sensory overload. 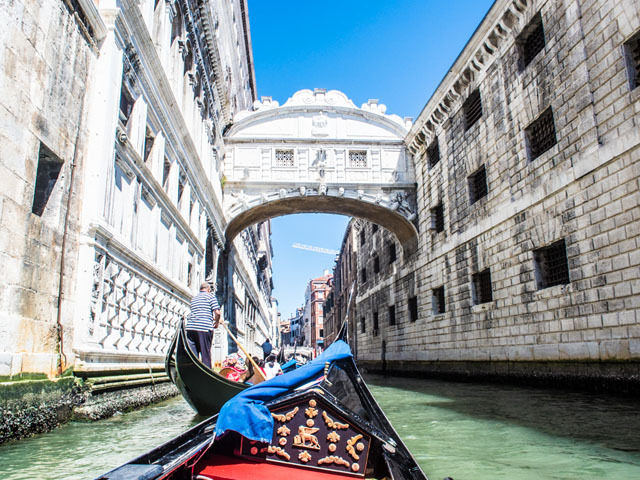 If your Gondola ride begins near St. Mark's Square, your entrance into the canals of Venice will start with a trip under the Bridge of Sighs (this is pictured in the lead image above). This is no coincidence for many reasons, but for those of you that are on the hunt for a romantic moment, there is one to be had here. Rumor has it that eternal love will be granted to those who kiss in a gondola under the Bridge of Sighs. No pressure there, boys. Oh, it also must be sunset and the bells of the Campanile must toll at the same time. A lot of organization but I like to think that kissing under the bridge at anytime holds the same value. If you're lucky, you'll also get a rather vocal gondola driver. Some sing on and off for the entire journey. In my experience, it's a nice finishing touch. But you're in charge. So if singing makes you cringe, shut it down. Otherwise, sit back and enjoy the serenading. 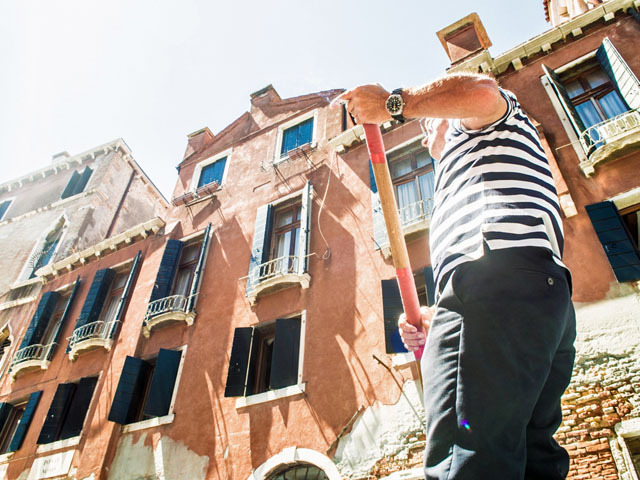 Just think of a gondola ride as your perfect mini education on everything Venetian. A good gondola driver will point out important historic sites, while also mixing in cheeky anecdotes. 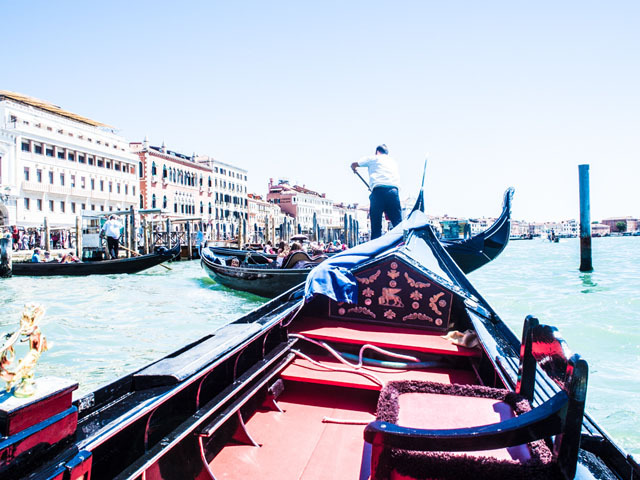 In short, I find I have learned more from a gondola than I ever did a guided tour of Venice. Or maybe it's just that I found everything much more interesting coming from a man that can sing, push our boat from city walls and smoke a cigarette all while navigating a rather busy thoroughfare. Yes, these men are uber talented. Now, here's where we get to the nitty gritty. Back in the day you could haggle with your gondola driver. These days, the prices are set in stone. To be honest, I think this makes everything a lot easier. You can choose two time lengths for your ride and I highly recommend you go for the longer. It's marginally more expensive, but you see so much more. Trust me on this - once you get on that gondola, you're going to wish you had all day to cruise around town. Plus, the expense is truly nothing in comparison to the memories that will be made. In short - get in the gondola, people.